1 Put the semolina, 50g sugar and butter in a bowl and work together with your hands until blended. Add the yogurt and bicarbonate of soda and mix well until you have a firm batter. 2 Grease a 23cm square cake tin with the tahini, then tip in the batter and spread evenly, flattening it gently with the back of a spoon. Cover with a clean kitchen towel and leave to rest at room temperature for 3 hours. 3 Preheat the oven to 200˚C, gas mark 6. 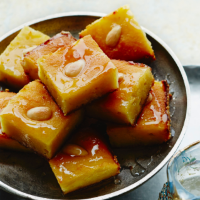 Cut the uncooked cake, in the tin, into 4.5cm squares and press an almond in the middle of each piece. Bake for 35-40 minutes, until golden. 4 Meanwhile, make the syrup. Heat the remaining 300g sugar, lemon juice and 120ml water in a pan over a medium heat, stirring occasionally, until the sugar has dissolved. Bring to a boil and bubble for 3 minutes, then stir in the rose and orange blossom waters and bubble for a few seconds more; set aside. 5 Pour the warm syrup over the hot cake and set aside for 30 minutes to allow the syrup to absorb. Recut into squares; serve.